In his weekly column “My Turn”, in the Guyana Chronicle, Prime Minister, Moses Nagamootoo said “there is no need to push the panic button” during this testing situation. Prime Minister Nagamootoo was referring to the recent disclosures of investigations which have been launched into the “massive vote-buying fraud and breach of national security by foreign agents,” following the December 21, 2018 vote. He said while diplomatic probes and police investigations may seem like a “television-like sequel,” the situation can be looked at from a broader perspective. “The better position could be one that looks not at troubles, but how we can turn the tides and grasp prospects ahead for national unity,” the Prime Minister wrote. He also noted that the meeting saw both sides committing to the national interest and constitution of Guyana. The Prime Minister’s entire article can be viewed below. EVEN after the crucial Government-Opposition meeting, I still saw yesterday a splurge of pro-opposition letters in sections of the media that aims at promoting confusion, or even fear of troubles ahead. Disclosures that investigations have been launched into a massive vote-buying fraud, and breach of national security by foreign agents, obviously are creating disquiet in some corners. But, even in this testing situation, there is no need to push the panic button. An Opposition back-biter did just that. With neither the gall nor gill to renounce his foreign (Dominican?) citizenship, he has called on “patriotic” ministers to resign, though his own leader has quite rightly accepted “100%” that the government remains in place pending outcomes of constitutional and other critical issues. I would add, diplomatic probes and police investigations, even extra-territorially, in what seems to be a television-like sequel titled, “follow the gold”. The better position could be one that looks not at troubles, but how we can turn the tides and grasp prospects ahead for national unity. In this context, a letter by a former prime minister about a national front government is more on point. “I can tell you this: it has been a very fruitful, constructive meeting…I have seen (and you don’t see this very often, but I’ve been around long enough), the display of marvellous maturity, calm and equanimity by the leaders in dealing with a situation that holds so grave implications for Guyana. “I believe that what has come out today is an affirmation by the national leaders that irrespective of what happens in this country, politically, they are both committed with their parties to the protection of the sovereignty of our country, to the protection of our territorial integrity so that no one, no country, could look at what is happening in Guyana, at the moment or since December 21st, and use that as an opportunity to weaken our country or threaten our sovereignty. “Some might have said that today would have been a meeting between the warlords. That did not happen. More or less, it was the opposite. It was a meeting of the peacemakers of two sides even though they have their own priorities and their issues. Some of these may be very controversial issues but they (the leaders) are committed to the National Interest. “The Leader of the Opposition said he came with an open mind. The President of Guyana, President David Granger, mentioned that we have our challenges and some difficult moments, but we must look at the opportunities which are presented to us as an open door to enter into discussions and dialogue. “In the end, the Communique will say that we (both sides) are committed to the Constitution of this country, which is supreme law; that nothing should be done to undermine the Constitution, nothing should be done to interfere with the stability of Guyana, to the peace and the order of our country. Nothing should be done to interrupt the delivery of services to our people, whether those services are regular or emergency services, they will continue. “They would explore that. But in the meantime, I think there is a recognition that the Parliament must continue; and inside Parliament, there would be potential for the parties to work together to deal with time-frames in which things can be done. 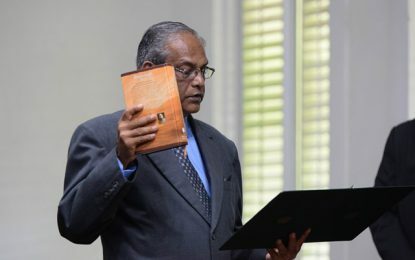 “I had said, at the time when the vote was taken on the no-confidence motion that the Opposition has to consider that it has now bought itself a seat at the table and that table has to be the table of negotiation, the table of dialogue, the table of mutual cooperation for the good of Guyana. “We are facing a future for our country that was undreamt of just a few years ago. It could change every single thing about our country, the way our economy develops, the way our society progresses, the future for our children and our grandchildren, and certainly the role of political parties within that new framework. So, you are not now dealing with parties looking at power, per se. You are looking at the dynamics that we may have to work together. “The Judiciary has now been engaged in an exercise. You cannot dictate to the judiciary or give it orders. The Judiciary may take what you call judicial notice of what the parties are doing and that by itself will tell the Judiciary that there are issues that must be dealt with in an expeditious way. But we should not interfere; we should not stop the judiciary. Or do what people suggested, to oust the jurisdiction of the court. “So, I saw from today’s meeting that there was calm and there was perspective. On the other side, there was not a condescending or an accommodating feature, but the government dealing with the issue in a very flexible way. It was not dogmatic on any issue. The President exercised skill and statesmanship, and leadership. “When you would have seen the Communiqué, you will see a reflection on both sides of statesmanship and leadership and that is good for Guyana. And, I can say down the line, if it continues in this way, it’s going to open other doors and we will see some of the things we have been dreaming about for decades that may not have been possible in our country. 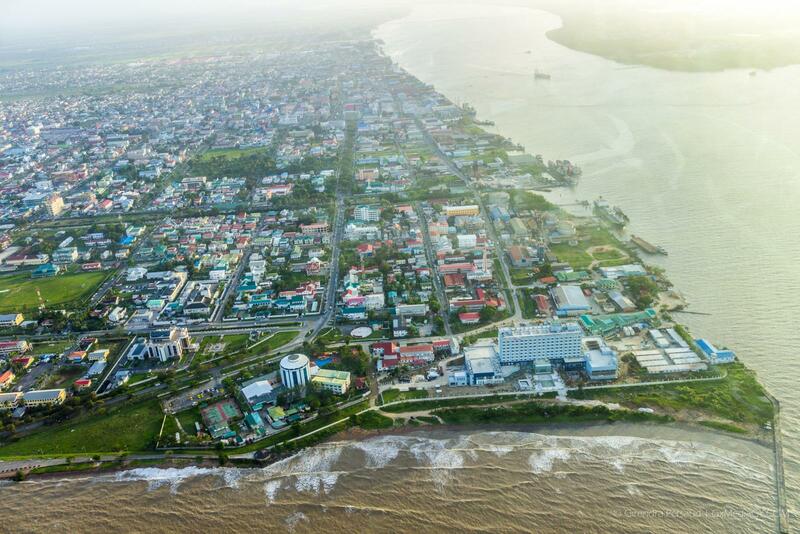 We may see a new Guyana emerging – a new governance…. I believe that today’s meeting would be part of the landmark development for our new politics and our new governance in Guyana”.